[Matt Silver] usually enjoys a cup of tea in the evening. Unfortunately, this habit can be frustrating and dangerous while sitting in bed. He rectified the problem by building this awesome space-saving table, which can be stored on the ceiling of all places! Depending on the supplies you might already have, this could be a relatively cheap build of about $40 or less. [Matt’s] using pine board for everything, but notes you could save time and money by re-purposing an existing coffee table. You will, however, need to make the ceiling frame to support it. At the heart of this build is our favorite rope—Paracord 550. [Matt] used a single piece to tie the whole thing together, which can cause the table to lower crooked, but [Matt] found he can keep it level by putting a hand on it while it descends. You also get mechanical advantage from the pulleys this way! If you’re not crazy about the potential unevenness, you could redesign the pulley and eyelet layout to allow for four ropes to ensure a reliably horizontal surface. Why not pair this idea with the portable electronics lab we shared a few days ago? You could have a full series of drop-down tool labs in your workshop. Think of all the space saving opportunities! 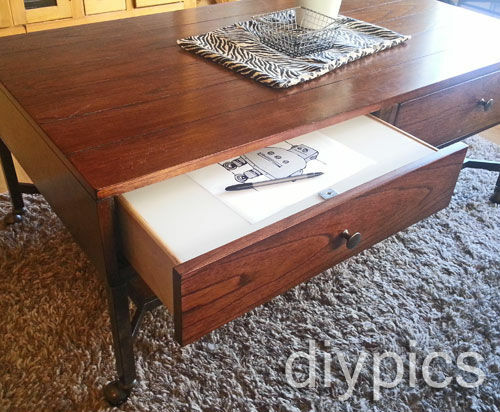 [Flyingpuppy] sent us this tip about her cleverly-concealed pull-out lightbox drawer. Her resolution for the new year was to make more art, so she filled this coffee table with art supplies and decided she’d draw while relaxing in front of the television. She also wanted a lightbox nearby, which originally involved hacking the entire tabletop with some acrylic, but she eventually opted for a simpler build: and it’s portable, too! The drawer’s lights are battery-powered, so you can pull the entire thing out of the table and drag it onto your lap, if that makes drawing more comfortable. [Flyingpuppy] sourced seven inexpensive LED units from her local dollar store, which she mounted to the back of the drawer with some screws. The rest of the drawer was lined with white foam board, the bottom section angled to bounce light up onto the acrylic drawing surface. Because she needs to open the case to manually flip on the lights, she secured the acrylic top magnetically, gluing a magnet to the underside of the foam board and affixing a small piece of steel to the acrylic. A simple tug on the steel bit frees the surface, providing access underneath. Stick around for a video below. First a quick announcement. We changed our “Kickstarter” category to “Crowd Funding“. We get a huge number of tips about crowd funding projects. We’re always interested in details. If you’re trying to get your crowd funding campaign on our front page make sure you’ve shared as many gritty project details (development process, problems/successes along the way, etc.) as possible . We usually prefer if this is done in a separate blog post from the campaign page itself. [Matthias] tells us that support for Rigol DS1052E oscilloscopes has been included in the 3.11 version of the Linux Kernel. Prior to this, getting the hardware to work on Linux was a hack, and a buggy one at that. For what it’s worth, here’s confirmation that support was added. A post about reverse engineering the FitBit Aria Wi-Fi scale was sent in by [Christopher]. This makes us wonder if you could patch into a digital scale, using your own electronics to spoof the FitBit version? We always keep our paperboard six-pack carriers so that we have a way to transport our homebrew beer. But rolling into a party with this laser-cut beer caddy which [Daniel] designed looks a lot cooler. [Antoine] spared no expense building a coffee table that showcases his old motherboards. The illuminated glass and wood art piece rang in at around $400 in materials. We’re a little more minimalist with our home decor. We still want something along the lines of this LED matrix version. Speaking of LED matrices, [Mario] dropped off a link to his LED Space Invaders game in the comments of last week’s Game of Light post. What we can’t figure out is why so many people hesitate to send in a tip about their awesome projects? [Hoogen] did a fantastic job of building arcade hardware into this Ikea coffee table. Sound familiar? We just looked at another Ikea coffee table arcade, but this one goes quite a different route. It uses a Ramvik table which has a very deep drawer in the end where the controls are located. The image to the left shows that you’re going to have a problem with the joystick when you try to close it. [Hoogen] came up with a clever mechanism to overcome this issue. This is not an emulated system. It uses a JAMMA board called the iCade 60-in-1 to bring sixty classic arcade games to the build. To interface with this hardware [Hoogen] included a JAMMA full cabinet wiring harness. The inset image on the right is pretty small, but it shows the speaker mounted in the back of the drawer, as well as the control surface angled down. This tilting surface is what allows the controls to move out of the way when closing the drawer. This happens automatically as described by [Hoogen] in his write-up. Get some Pac-Man fever while sitting on this couch thanks to the arcade rig built inside of the coffee table. The controls are a bit more sparse than more dedicated MAME rigs, but you should still be able to play most of the classics with four buttons and a joystick. After all, you need to reserve some room to put your feet up when you’re not gaming. [Manny Flores] started the project with a Lack table from Ikea. The top is anything but solid. After tracing the outline of his LCD screen and cutting through the surface he discovered this is more of a beefed of cardboard than it is wood. The honeycomb of paperboard inside the surface of the table makes it really easy to clear out some space. In fact, when it came time to add the arcade buttons he just used a utility knife to cut the openings. Inside you’ll find a Raspberry Pi which interfaces with the buttons and joystick via an iPac USB controller board. A set of powered speakers mounted on the underside complete the design. Members of the Warp Zone hackerspace wanted a coffee table that was beyond ordinary. They ended up pouring a concrete base for the glass top (translated). There were several things to address during the design. First off, they wanted to integrate LEDs in the concrete sides. Some consideration had to be made for portability as concrete is very heavy. The final piece of the puzzle was deciding what kind of hardware to place beneath the frosted glass. The legs were designed with a large cut-out area to keep them as light weight as possible. The cross piece has a set of voids spelling out the name of the hackerspace with some green LEDs. This was accomplished by placing foam cut-outs of each letter in the forms before for concrete was poured. They sealed around each letter with silicone, but still had some seepage most likely caused when jostling the form to help remove air bubbles. Straws were placed in the foam to allow a cable pass through for the electronics. After everything was in place they filled the voids with hot glue to act as a diffuser. There aren’t a lot of details about the RGB LEDs under the frosted glass. But you can see the light show they produce in the clip after the break.